This unique octopus decanter is a truly impressive piece of art that will make a great addition to any home bar or to set off on its own in a place of honor. 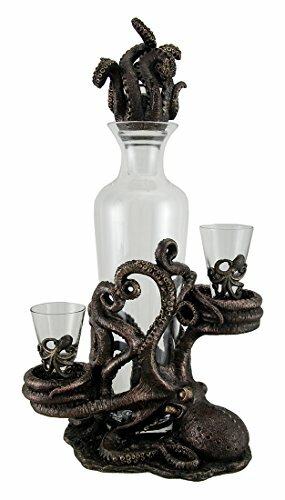 The clear glass decanter is set in an octopus sculpture, and cradled by its tentacles. The stopper is topped by additional tentacles while others cradle two shot glasses, each of which feature an octopus detail on them. The figure has been given a detailed antique bronze metallic finish and hand painted to give it further texture. The result is an intricate piece that has a vintage vibe. Use the carafe for wine, whiskey or whatever libation you prefer. Makes a great gift for the discerning decorator who appreciates something different.